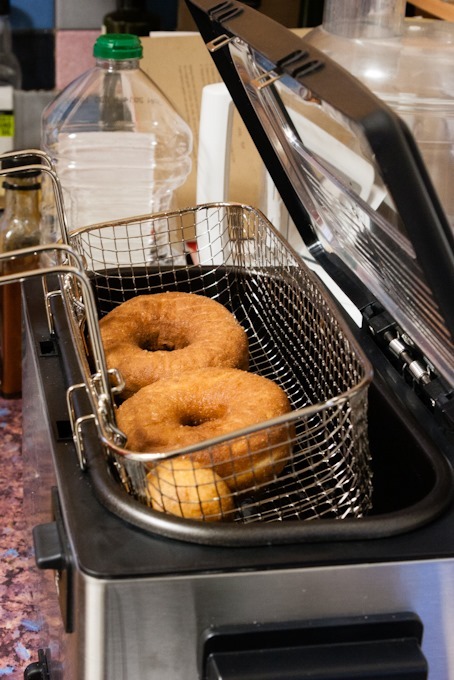 As anyone who read my post about Glazed Vanilla Bean Doughnuts will be aware, we were recently sent a Judge Cookware Multi Basket Deep Fat Fryer to review and I had a list as long as my arm of recipes to try! 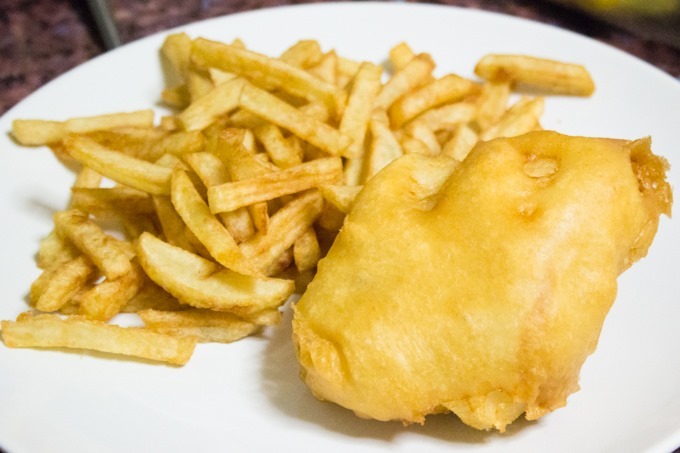 In an era that’s obsessed with healthy eating for longevity, in which media tells us one more food group to avoid after another, and where fried foods are often dismissed as “dirty” it seems that the deep fat fryer, or chip pan, has lost much of it’s former allure. But whilst oven chips have become ubiquitous, baked doughnuts, samosas and battered fish simply don’t compare to the real (fried) deal! Of course, fried chips are better than the oven version too. So far we’ve made those lovely vanilla doughnuts, fried some firm silken tofu which we’ve served with tinned pineapple and sweet and sour sauce, enjoyed southern fried chicken with chips, chips again, and lastly, fish and chips in a thick beer batter. We’re finding the fryer pretty straightforward to use. It comes with a large basket and two single baskets, but we’ve used the large one for everything so far. The baskets feel very flimsy but seem to be fine in use. 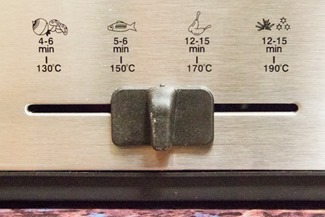 The thermostat makes it easy to heat the oil to the required temperature for different recipes. 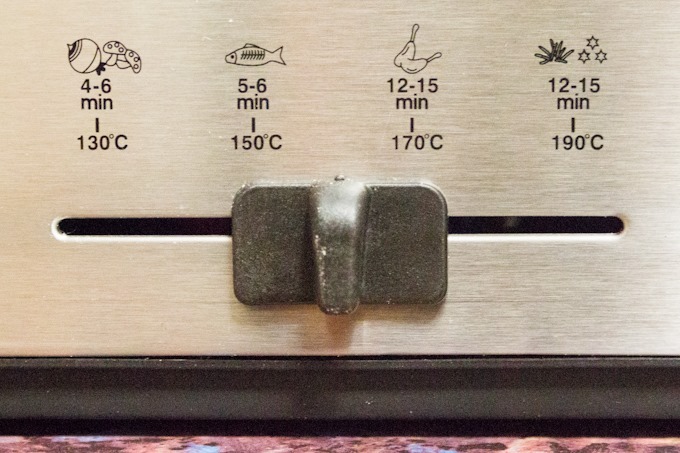 The range is 130 to 190 C.
The oil heats up pretty fast, and the indicator light makes it clear when it’s reached temperature. There’s also a light to show when the unit is switched on, which should help those worried about leaving the unit on by accident. The lid has a filter built into it, described as a lifetime filter. Certainly, the only thing that escapes through it is steam so the kitchen doesn’t get too smelly. There’s also a window in the lid which lets you see the colour of the food as it cooks but I find it easier to flip the lid open and get a proper look. The hinge design isn’t ideal as the lid doesn’t rest at a fully vertical position when open, but it’s manageable. The fryer takes about 2.5 litres of oil to fill. Probably the main negative is that the only concession to emptying the fryer are two very faint grooves at the corner, which are described as a “pouring channel”. 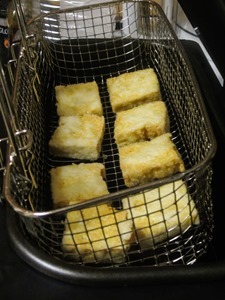 Lifting the entire fryer, when full, and pouring the oil away from that corner, is a challenge. And the oil tank doesn’t come out for cleaning like many models at the same or lower price point, which is a real shame. Because of that, we’ve fallen into a pattern thus far of filling with clean oil and then using four or five times over a week or two until the oil is ready to throw away. The idea is to then put the fryer away for a good few weeks, otherwise we’ll be eating fried food way too often! By the way, don’t pour used oil down the sink or it will clog up your drains. Pour it back into an empty bottle and drop it off at your local recycling centre, where they can deal with it properly. Everything has cooked evenly and pretty quickly too. It’s not been overly greasy, though that’s more a factor of choosing good recipes and cooking at the correct temperatures, I think. Overall, we’re happy with the fryer. 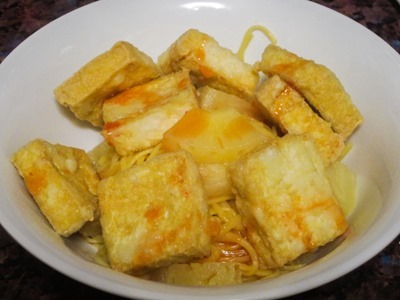 If you have any great deep fried recipes to recommend, please let me know in the comments. Thank you! 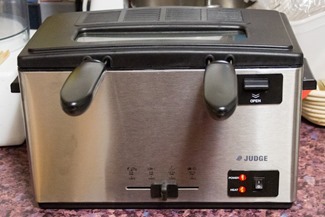 The Judge Multi Basket Deep Fat Fryer is currently listed on Amazon for £62.95. RRP is £125 but most retailers that stock this unit sell it at around the same price. 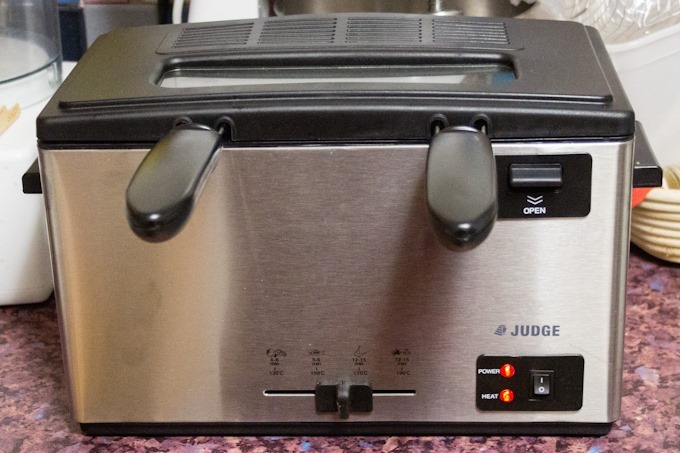 Kavey Eats was sent a review unit from Judge Cookware. 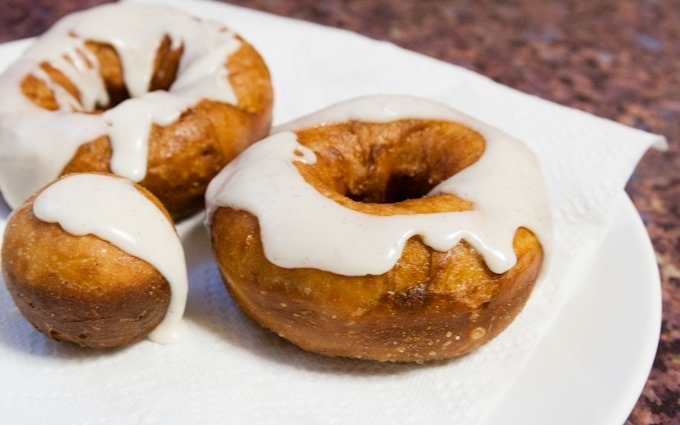 4 Comments to "The Joys of Deep Fat Frying"
Kavey those doughnuts look amazing. 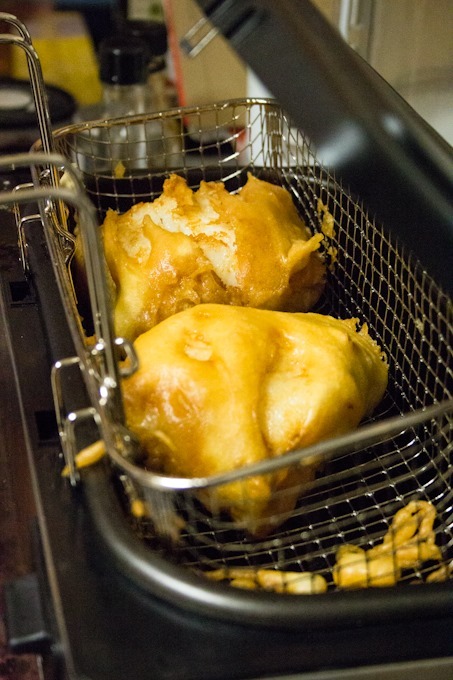 I feel like I need a deep fat fryer in my life for pretty much all the food you’ve listed! That fish just looks perfect, smooth beautiful batter. I think the issue people have with deep frying things is that if you fry at the wrong temperature, things can get greasy. I think everything is fine in moderation. I love deep frying too, and have tried all sorts of things, latest was Japanese fried chicken last week. I’ll link to a few things I’ve done, some more sensible than others, but all great tasting!